I’ve started this food diary project with these acid-alkaline foods charts, and I will soon add many more features and benefits. I will provide you with your free, personal online food diary. These charts are basic, but the finished project will be rich with many features that allow you to manage your diet. I have many ideas for turning this basic information into an interactive service to help you plan your diet, but I also want your ideas. Your feedback will help me build this project quickly to provide you with better nutrition management tools. One such recent improvement is my Alkaline Pasta List. All negative values have an alkalizing effect. 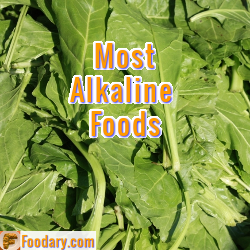 Remember, your diet has to contain a good mix of acid and alkaline foods. Around 60% to 70% of calories should come from alkalizing foods. The numbers are only a guide to help you make better food choices. The true test comes from measuring urine pH using a meter or test strips. You are very kind, Rose Marie. There’s much more I want to do, but never find the time. Your kind words encourage me to make that time. I too share Rose Marie’s comments. I have been inflicted with the dreaded “gout”, and your site has the most comprehensive list of food pH levels, after being processed by our bodies, that I’ve found.